Since the success of products significantly depends on the quality of product performance, inadequate management of the product design process can lead to improper performance of products that can result in significant long-term business losses. 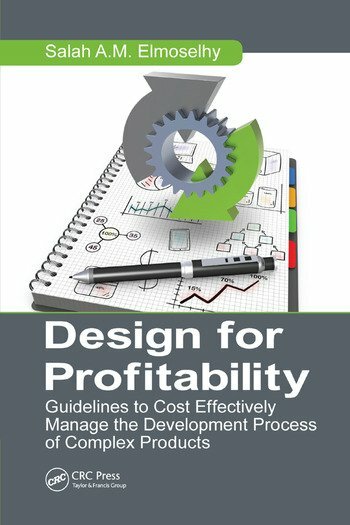 Design for Profitability: Guidelines to Cost Effectively Manage the Development Process of Complex Products presents a design guideline for complex product design and development that enables you to cost-effectively improve the technical performance of your products and consequently improve your competitiveness in the marketplace as well as improve profitability. The book helps you improve the competitiveness of your organization in the market and eventually improve profitability. It presents a mobile robots design guideline based on an empirical study of the mobile robots design process. This is an unprecedented guideline based on the empirical investigation of the internal aspects of the design process of complex products for cost-effectively enhancing the competitiveness in the market. The book also presents a hybrid lean-agile design paradigm for mobile robots. In addition, it points out key approaches and risks to manage the product development process efficiently. In designing complex products and integrated systems, industrial designers face a dilemma of cost-effectively striking a balance between product development time and product performance attributes. This book shows how and when value is added in product design and development through identifying statistically the most and least correlated design activities and strategies to product performance attributes. Introducing a new paradigm in the field of engineering design, the book gives you key approaches to efficiently manage the product development process. Salah A.M. Elmoselhy holds a PhD in mechanical engineering under joint supervision of the International Islamic University Malaysia (IIUM) and the Center for Sustainable Mobility at Virginia Polytechnic Institute and State University (Virginia Tech). He holds as well an MS in mechanical design and production engineering from Cairo University and an MBA in international manufacturing business from Maastricht School of Management (MSM). He has ten years of industrial experience in CAD/CAM and robotised manufacturing systems. He has been recently a researcher at the Engineering Department and Fitzwilliam College of Cambridge University from which he received a Diploma of postgraduate studies in engineering design. He has authored/co-authored about twenty-five refereed publications including ISI-indexed and SCOPUS-indexed journals and conference publications. His research appears in journals such as SAE Transactions: Journal of Materials and Manufacturing, Journal of Manufacturing Systems, and Journal of Mechanical Science and Technology. He is an Associate Member of the IMechE, recipient of the 2009 ASME Award of Excellence in advancing the engineering profession in robotics, and Member of the Editorial Board of the Journal of Industrial Engineering & Management. "Through analyzing design of experiments and correlating positive/negative effects, the author has summarized a guide for designers and developers to ensure product development and product performance are cost effectively balanced. The author has been able to give important clues to where product developers should focus or avoid additional resource effort in successful complex product development."